MANILA, Philippines – The October 2018 Chemist and Chemical Technician board exam results including the official list of passers, topnotchers (top 10), top performing schools and performance of schools are released online on Monday, October 15 or in two(2) working days after the exam. As announced, 496 out of 1,101 passed the Chemist Licensure Examination and 1,673 out of 1,916 passed the Chemical Technician Licensure Examination. The Professional Regulation Commission (PRC) conducted the Chemist licensure exam on October 9 and 10 and Chemical Technician board exam on October 11, 2018 in the cities of Manila, Cagayan de Oro and Cebu. Note: Those who failed to pass the board examination for Chemist but had obtained a rating of at least 70% in any two (2) subjects can register as Chemical Technician. From October 18 to 19, registration for the issuance of Professional Identification Card (ID) and Certificate of Registration will be done on-line. Please go to http://online.prc.gov.ph/ and follow instructions for initial registration. Chemist and Chemical Technician board exam's verification of ratings (passers, non-passers and removal) can be done online. The two-day examination for Chemist covered the following major subjects: inorganic chemistry (25%), organic chemistry (15%), anytical chemistry (25%), physical chemistry (20%) and biochemistry (15%). According to PRC Resolution No. 2017-1068, the target release date of the recent Chemist and Chemical Technician board exam results is on Monday, October 15 or in two (2) working days after the test. In the October 2017 exams, results were out in 2 working days. 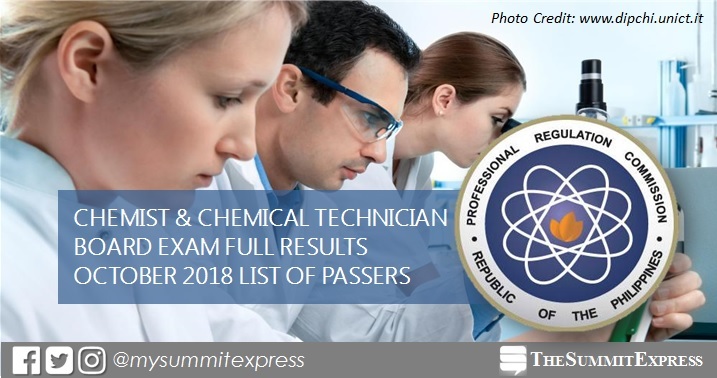 A total of 526 out of 1,195 passed the Chemist Licensure Examination and 720 out of 845 passed the Chemical Technician Licensure Examination. In the October 2016 exams, results were released in 2 working days. A total of 559 out of 1,019 passed the exams.